When you search for something on Google, we try to provide you the highest quality information we can. Our engineers are constantly experimenting to find better ways to connect you with useful information, and, increasingly, to provide direct answers to your questions. We take that same approach to online shopping searches. If you’re looking to buy a <coffee machine> or a <cast iron pan>, we want to connect you directly to merchants who sell them, whether that’s through organic links or ads. In recent years, we’ve improved the format of our ads to include more informative displays with pictures, prices, and links where you can buy products. Showing more useful ads benefits us, our advertisers, and most of all, you, our users. That’s why we disagree with the European Commission’s argument that our improved Google Shopping results are harming competition. As we said last year in our response to the Commission’s original Statement of Objections (SO), we believe these claims are wrong as a matter of fact, law, and economics. The Commission’s original SO drew such a narrow definition around online shopping services that it even excluded services like Amazon. It claimed that when we offered improved shopping ads to our users and advertisers, we were “favouring” our own services — and that this was bad for a handful of price comparison aggregators who claimed to have lost clicks from Google. But it failed to take into account the competitive significance of companies like Amazon and the broader dynamics of online shopping. Our response demonstrated that online shopping is robustly competitive, with lots of evidence supporting the common-sense conclusion that Google and many other websites are chasing Amazon, by far the largest player on the field. We then showed that our improved ads were helpful to users and merchants. We never compromised the quality or relevance of the information we displayed. On the contrary, we improved it. That isn’t “favouring” — that’s listening to our customers. This summer, the Commission sent us a revised version of its case called a Supplementary Statement of Objections. The Commission’s new filing didn’t offer a new theory, but argued that because sites like Amazon sometimes pay price comparison aggregator sites for referred traffic, they can’t also be considered rivals. But many companies simultaneously compete and cooperate. And in fact Amazon gets only a tiny fraction of its traffic from these services, hardly enough to support the idea they don’t compete with price comparison sites and a range of other internet shopping services. Our second response, filed today, shows that the Commission’s revised case still rests on a theory that just doesn’t fit the reality of how most people shop online. Consumers don’t just look for products on a search engine, then click on a price comparison site, and then click again to visit merchant sites. They reach merchant websites in many different ways: via general search engines, specialist search services, merchant platforms, social-media sites, and online ads served by various companies. And of course merchants are reaching consumers directly like never before. On the mobile web — and more than half of Europe’s Internet traffic is mobile these days — dedicated apps are the most common way for consumers to shop. While there’s no indication that the Commission ever surveyed consumers, the evidence is clear: consumers can and do click anywhere and navigate to any site they choose. All of these services — search engines, price comparison sites, merchant platforms, and merchants — compete with each other in online shopping. That’s why online shopping is so dynamic and has grown so much in recent years. In the year-and-a-half since the Commission’s original filing, we’ve seen even more data confirming this. For example, a recent study shows that for many German online shoppers, Amazon is the first port of call on the web. A third of online consumers first go to Amazon, irrespective of where they ultimately make their purchases. Only 14.3% go first to Google, and only 6.7% to price comparison sites. 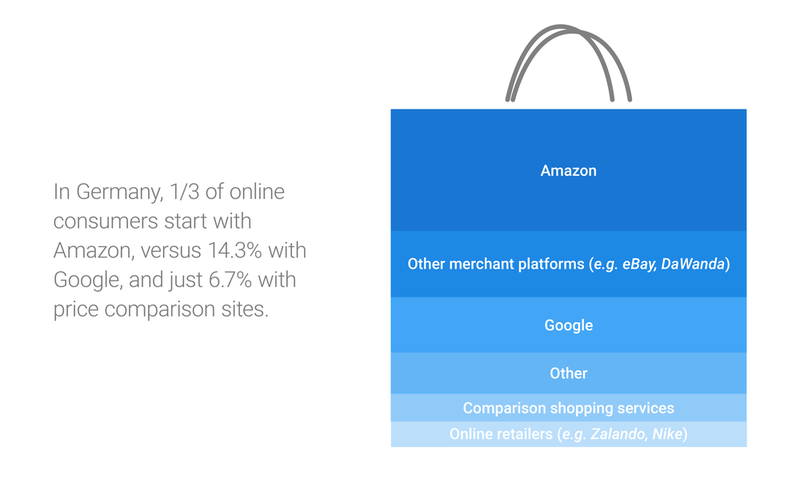 A recent US study shows similar results: 55% of US consumers start their online shopping on Amazon, 28% on search engines, and 16% go straight to individual retailers. The Commission also claims consumers don't go to Amazon to compare product features and prices. But Amazon provides tools to do exactly that, plus the ability to buy products and have them delivered the next day, which makes Amazon an even stronger competitor. It’s not surprising that when Amazon and other new competitors arrived in European countries, traffic to sites offering only price-comparison went down. As the market changes, there are inevitably shifts among competitors. The data show that the handful of price comparison sites who’ve filed competition complaints don’t reflect the wider marketplace. There are hundreds of shopping comparison sites and over the past ten years, some gained traffic, others lost traffic. Some exited the market, others entered. This kind of dynamic competition is undeniable. Online advertising is evolving rapidly, with companies like Facebook, Pinterest, and many others re-inventing what it means to connect merchants with consumers. There is simply no meaningful correlation between the evolution of our search services and the performance of price comparison sites. Meanwhile, over those same ten years, a rapidly increasing amount of traffic flowed from our search pages to popular sites like Amazon and eBay as they expanded in Europe, hardly a sign of our “favouring” our own ads. The Commission’s revised filing suggests we shouldn’t use specialized algorithms to highlight what we consider to be the most relevant merchants’ ads for our users, but should instead highlight ads from price comparison sites. But we get feedback from our users every time they use our services and their clicks tell us that this just isn’t how they want to shop. Forcing us to direct more clicks to price comparison aggregators would just subsidize sites that have become less useful for consumers. Ultimately, we can’t agree with a case that lacks evidence and would limit our ability to serve our users, just to satisfy the interests of a small number of websites. But we remain committed to working with the Commission in hopes of resolving the issues raised, and we look forward to continuing our discussions. Today we have also filed our response to the Commission's concerns about our advertising service AdSense for Search, and in the days to come we will respond to the Statement of Objections about our Android operating system. These cases involve different claims and different substantive questions, but similarly cite just a few complaints to justify broad legal claims. We’re confident these cases will ultimately be decided based on the facts and that this analysis will show our product innovations have benefited consumers and merchants, and expanded competition. The surest signs of dynamic competition in any market are low prices, abundant choices, and constant innovation — and that’s a great description of shopping on the internet today.